Valentine’s Day is fast approaching. 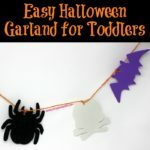 I love to decorate for each holiday, but with two toddlers I like to keep things simple, easy, and fast. 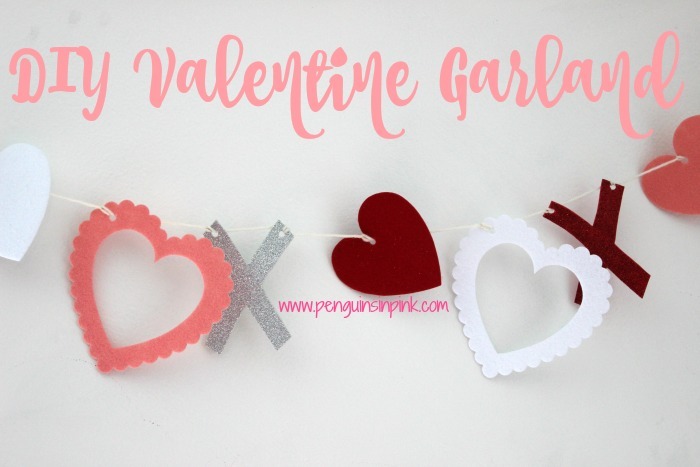 This DIY Valentine Garland fits all of three of those requirements. 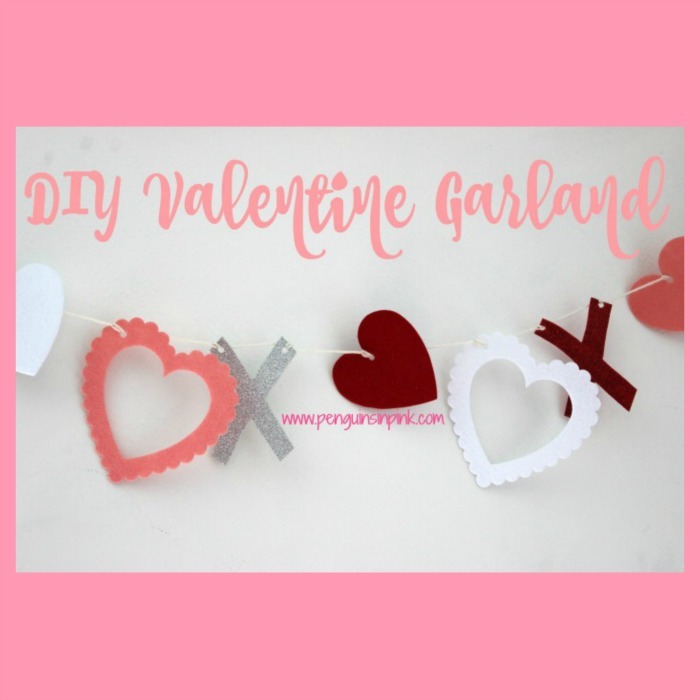 Valentine garland is super easy to make. 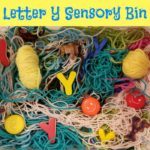 You can make it out a variety of materials like construction paper, cardstock, scrapbook paper, felt, foam, etc. For my Valentine garland, I used a pack of die cut felt hearts from Target and glitter foam paper. I’m sure you can find a similar pack of hearts at Michael’s, JoAnn’s, Hobby Lobby, etc. Maybe you will luck out and find some die cut X’s too. Using die cut heart shapes really saves time. I found the diecut heart felt shapes from Target in their Valentine section last year. I was unable to find die cut X’s so I had to make them myself. Cakey and Doodles wanted to use glitter foam paper because… well… they love glitter! Double that length and measure and cut your twine, yarn or string. Decide on your pattern, I did open heart, X, heart, repeat. Trace multiple X shapes on colored foam. Cut out all the X’s. Using the hole punch, punch one hole into each heart and two holes in the X’s. Stack your hearts, open hearts, and X’s in your pattern of choice. Using twine, yarn, or string tie a tight knot into the first shape to anchor the chain and keep it from coming undone. Move a couple of inches (mine are spaced 4 inches apart) and tie a simple slip knot into the shape. Repeat with remaining shapes. On the last one, tie a tight knot to keep the chain from coming undone. I normally hang garland across the main entrance way into the living room and above the kitchen bar. I like to leave about 12 inches hanging down the sides just long enough that neither the cat nor the kids can reach it! 🙂 Since I hang garland of some sort there for each holiday, I leave up the Command Hooks so I don’t have to put them up and take them down numerous times a year. I love how my Valentine Garland came out. I was able to make it quickly even with the assistance of Cakey and Doodles. The garland folds up well. I was very happy to see that nothing broke or got bent since all I did to store it last year was neatly fold the Valentine garland up and store it in a Ziploc gallon bag before we moved. Do you decorate for Valentine’s Day? 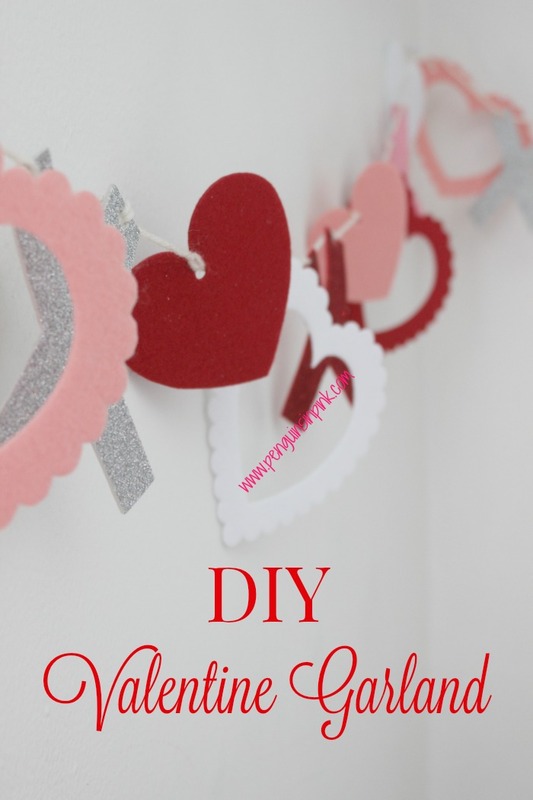 What would you make your DIY Valentine Garland out of?